Old lighthouses, stately homes, a picnic on the River Thames and a bespoke exhibition in a gorgeous new gallery in downtown Plymouth England. To say the least, Andrei’s 2018 tour in the UK was as always an exciting and adventurous trip. We had two exhibitions booked this year. One show was in one of our favorite galleries in Salisbury, Gallery 21 and the other was at the Host Gallery in Plymouth. LONDON, ENGLAND - You’ve read it in the news and you’ve seen it on the streets! Andrei is coming back to the UK in a few weeks! Giclee's are a contemporary fine art reproduction medium that combines cutting edge ink technology, 200+ year archival media and precise scanning and proofing. Andrei’s giclee limited editions are some of the closest reproductions of original artwork by any contemporary artist today. Is a Hundred Million, Words or Dollars, Worth the Image? Andrei Protsouk creates unique one-of-a-kind original hand painted frames for his limited edition and original artwork. They add a unique enhancement to the painting and an extension to his artwork image. NEW YORK, NY - Andrei Protsouk and Art & Design Publishing had great success and turnout at Artexpo this year. Protsouk celebrated his 20 year anniversary doing the show. As expected, Andrei attracted many visitors to his booth and quite many new collectors. Admirers of Andrei's work ventured to visit New York's Pier 94 from as far as Ohio! What a great show it was. Andrei managed to sell 17 pieces this year! We can't wait to see the photos of them hung in their new beautiful homes. We also would like to thank everyone for coming to the show and we will forgive those who did not make! Please enjoy the video below for a recap of the show this year! CLEVELAND, OH - Andrei Protsouk has again had remarkable success attracting new collectors and art lovers to his beautiful artwork. Margarita and Dmitry Shuster were great hosts this year at Opus Art Gallery in Cleveland Ohio. They invited their most beloved clientele to meet with Andrei and experience his newest collections from the artists explanations. Protsouk was proud to bring his newest work from his Gourmet Wine Collection, Cities of Romance Collection and Paradise Collection. The show is still open for public view through the end of the month. The gallery is located at 27629 Chagrin Blvd, Cleveland, OH 44122. They are open Monday through Saturday from 11 am to 5 pm. You can see the highlights of Andrei's show and trip to Cleveland below! We also want to graciously thank everyone who came out to the show for their support and appreciation of Fine Art! Highlights from It's Time for Love @ Opus Gallery Cleveland Ohio! A fantastic opportunity to meet this modern Master and absorb his warmth and enthusiasm in person. Cocktails & Collecting November 5, 6-9 p.m.
Andrei Protsouk will be featuring his artwork at the annual fundraiser for the Allentown Art Museum of the Lehigh Valley. Protsouk will be unveiling some of his newest artwork at the show. Come meet the artist if you are in the area. Please visit the Allentown Art Museum's website for tickets and more information! We look forward to seeing you there! Today’s Artwork of the Day is “Have a Nice Day,” a 40″x 48″ oil on canvas by Artexpo New York 2011 exhibitor Andrei Protsouk. 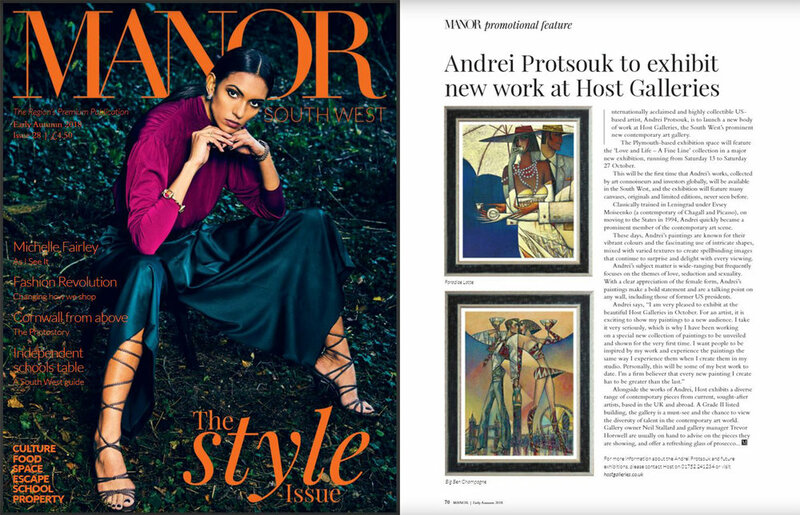 Andrei Protsouk favors gold or silver leaf — and remnants of the original oil paints he brought with him from the Soviet Union in 1990 — in the manner of the traditional Russian iconographers. Andrei updates their style to sometimes ironic ends: here his icon is a flashy, Hollywood-style cowboy, presented with that quintessentially American phrase, “Have a Nice Day”. From his studio and Andrei Art Gallery in Stroudsburg, PA, Andrei runs his art publishing operation and andreiart.com to reach collectors around the world. Andrei has displayed his art in Germany, Holland, Russia, Ukraine, and across the USA. His works are a part of private and corporate collections around the world, including the Academy of Art in New York City; Barcelona Museum of Art, Spain; Italian Art and White Knights of Venice, Italy; Museum of Art Academy in St. Petersburg, Russia; Francais Lang Art, Hamburg Germany; Art Connections, Zurich, Switzerland; Gallerie Adrienne, San Francisco; Artrageous Gallery, New York City, Phoenix; and Vera Gallery, Aphine, Greece. We look forward to welcoming Andrei Protsouk at Artexpo New York 2011. To Learn More About Andrei, visit his andreiart.com. Artexpo 2011!!! Our 10 Year Anniversary!!! New York, New York - International Artexpo 2011 - Pier 94 - From what started as an annual art show in 2001 to a great art business Andrei has built over the last 10 years. Andrei has made many great relationships within the art communities around the world. He has truly devoted the sharing of his passion for painting over the years. He says his artwork tries to build on real emotion but with a more fantastical eye. His courageous lines transcend the colors in to a more imaginative world with sophisticated textures. The devotion to his craft and his imagination transcendes from within his knowledge about fine arts, in his strict discipline and conception of composition. As a contemporary painter Andrei Protsouk doesn't stay shy from bold statements of passion and sensual imagery. So, we want all of our friends to help him celebrate these ten years of prolific talent, his spirit and as an awesome family man! The economic times see an optimistic future and Its an exciting time in the art community to work together and spread the knowledge and spirit of art. It is incredible to see imagination and feel it. What better place to celebrate than New York City! Andrei will be exhibiting his artwork to the trade and public March 25th - 27th 2011 in the International Artexpo 2011 @ Pier 94 On The Hudson at booth 851B! It would be great to see some familiar faces at the show! Contact Andrei by email for more details! We are so excited for the upcoming years and a fresh decade; our new slate. Hope you all could make it! ABOUT THE ARTIST: Andrei Protsouk has displayed his art in many exhibitions around the world, including Germany, Holland, Russia, Ukraine and America. Stroudsburg, Pa- Art and Design Publishing are proud to announce Andrei Protsouk’s new collection of paintings. This collection is Andrei in retrospect; a collection of paintings he painted in his earlier years. Most of these paintings, like “The Cosmonaut” or “Gift”, were only exhibited once when Andrei came to the U.S in the early `90’s in Soho, New York City. Protsouk has been anxious to introduce these paintings again but has been waiting for the right time. In a collaborative effort Andrei has been working on a book as well. He plans on reviving his earlier paintings and creating limited edition prints from them as well. Andrei has been working on the book, “Now and Then: Works of Art” for a while now; slowly putting together images. He plans on unveiling his book plans on the website soon. “Now and Then” will feature 100 pages with over 200 of Andrei’s images. It will also feature many rare drawings and studies. He will be offering limited editions of the customer’s choice along with the book. Keep checking Andrei Art blog for more information about the upcoming book, “Now and Then: Works of Art” and news about Andrei Protsouk. St. Petersburg, FL- Andrei Protsouk has been busy this fall/winter season working with St. Andrew’s Church on an integrative project to revitalize their parish in St. Petersburg, Florida. St. Andrew’s is one of two Eastern Orthodox Churches in the state of Florida. The parish has expanded and moved to a new location in the St. Petersburg/Tampa area trying to outreach to a larger Russian Orthodox following. In part of the construction of a new parish the church commissioned Andrei Protsouk to create new icons for their efforts to reposition the church in the new area. Father Igor, pastor of St. Andrew’s, views Andrei’s iconography symbolically to the new location and sees his talents as growth and a new direction, not only for their members but to the Russian community living in Florida. His hopes are that people come to St. Andrew’s not only to pray but also admire its beauty and its icons. St. Andrew’s hopes this revitalization project brings a larger following, a stronger Russian community in the area and a stronger patronage to Orthodoxy. In St. Andrew’s Andrei was able to aspire to his inspiration, his influence and captivate his style, his lines and the feelings of past icon masters especially that of Andrei's favorite icon school in Novgorod, one of the most traditional icon schools in Russia. When one carries his eyes from the “Nativity” scene to Alexander Nevsky’s stern expression or Andrei Stratilat’s armor, one will be able to see how Andrei’s strokes resemble his other paintings with the nuances of his lines. His vibrant color choices and dramatic facial expressions of Joseph, Mary and Jesus are brought to life at St. Andrew’s not only for their own Parrish but for all of Orthodoxy and everyone to see. ANDREI PROTSOUK WANTS TO INVITE YOU TO THE ANREI ART BLOG: A COMMUNITY FOR ART LOVERS AND COLLECTORS! We are very excited to unveil the very first blog post for artist Andrei Protsouk. Subscribe to this blog to receive information about Andrei's latest inspirations, paintings and collections. We will hopefully be adding testimonials, stories and news about where Andrei's paintbrush takes him next. On this blog we will feature new promotional limited editions, updates on low editions and information about how to collect Andrei's artwork. I hope you visit www.andreiart.com to see the latest images available!! Thank you for visiting Andrei Art Blog and follow Andrei on Blogspot.com!